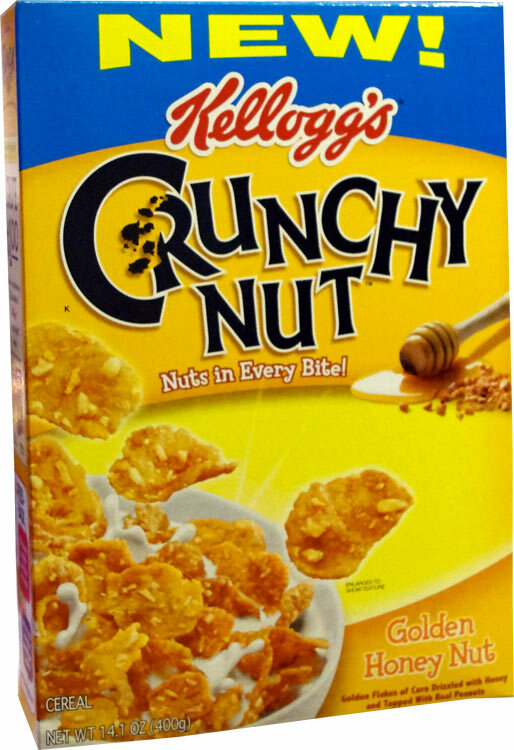 The complete name of this cereal is Crunchy Nut Golden Honey Nut Cereal. I'm referring to it as "flakes" because another Crunchy Nut cereal was introduced by Kellogg's at the same time... one which has O-shaped cereal pieces. Versions of this product have been available in the U.K. for a couple years now.... Let me happily say, "Welcome to the U.S.A. Crunchy Nut Flakes!" Cereal lovers in the know will recognize this product as a kind of remake Kellogg's Nut & Honey Crunch, a cereal that was popular in the 1980's. You might remember the commercials where people mistook "Nut & Honey" for the phrase "Nothin' Honey." IE. "Do you remember Nut & Honey?" To which, you would reply, "I remember everything, Honey." Like its predecessor, this Crunchy Nut cereal is very good. It is, above all else, crunchy.... so much so that I'd actually advise caution when eating it. The crunchy flakes can feel somewhat sharp in the mouth. You'd need to shovel a lot of flakes in your mouth at once to do any damage. So fast eaters, please be advised. The flakes stay crunchy in milk for upward of 5 minutes. The flavor might remind you of Frosted Flakes with more personality. There's tiny bits of peanuts coating each flake. In milk, the nuts lend a general nuttiness to the overall flavor. When eaten dry, it's easier to isolate that nutty flavor as peanuts. According to the ingredient list, this Golden Honey Nut cereal actually has more sugar than honey. That's apparent in the flavor and some will find this cereal a little too sweet. I'm recommending this cereal for it's nostalgic appeal. If you ever tried Nut & Honey Crunch, this cereal will bring back memories. Alas, with memories come regrets... and I do regret that in 20 years they still haven't found a way get one lousy gram of fiber into a serving of this crunchy, tasty stuff. Nutritional Considerations: Each 3/4 cup serving has 120 calories, 1 gram of total fat (0 grams trans and 0 grams saturated), 26 grams total carbs, less than 1 gram of dietary fiber, 11 grams sugars and 2 grams protein. 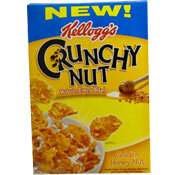 What do you think of Crunchy Nut Flakes? Is there even any need to rate this? Like damn, these are good! 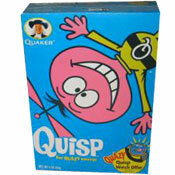 I love this cereal and now I cannot find any! Some sites say Kellogg's discontinued it! I sure hope not! This is easily the best cereal, ever. I like the honey nuts more than the caramel one. I am so in heaven. Stays crisp in milk. The sweetness kind of overpowers it, but I love the nutty flavor. It makes a nice snack food! Very addicting. I really enjoy this cereal. It is definitely sweet though, and the flavor reminds me sort of cracker jack, which is a good thing to me. The only nutritional downsides... high sugar and only 2% of daily fiber, which is lower than even the sugariest kids cereals. The honey o's kids has 8% daily fiber, but is nowhere near as good. I'm really sorry to say that I didn't like this at all. It was not good in my opinion, I do not like that there are so many nuts in it. I think it is just too crunchy for a cereal. Sorry... but I like the strawberry cereals better because they are soft and yummy. This is my favorite new cereal. It has a sweetness like Frosted Flakes, but the honey makes you feel less guilty to eat it. This cereal also stays really crispy in milk which is a definite plus. It stayed crisp in milk. However the cereal was just too sweet for me. I purchased 2 boxes to try it out, but ended up returning the second box. Much too sweet for my tastes. It tasted like I was eating some kind of processed syrup product. This cereal is shellacked in an incredibly sweet coating. It doesn't taste quite like honey but has a sort of manufactured caramely taste. Be careful of this cereal, it is very crunchy and extremely sharp. Despite being overly sweet for my palate, I found it extremely addicting. It stays very crispy in milk and is a filling cereal. The sweetness was overkill for me. I also tried a version with nut-covered O's, which came out at the same time - liked it better, but wasn't blown away. Take a look at the box-clip out the cardboard rebate and submit with your receipt and you can try it for free. Tried the King's Crunchy Nut O's it didn't taste that great. This cereal reminds me of Nut and Honey Crunch.